Alan Simon, creator and composer of Excalibur, explains what you can expect in the fourth chapter of the rock opera. Why and how this unexpected return has been possible? Unexpected is the correct word. I owe this return to a successful configuration. My manager Daniel Eanrshaw introduced me to a great German promoter Manfred Hertlein. First at all Daniel and Manfred are real music lovers. Daniel knows each solo title of the members of Yes or Pink Floyd. Manfred is also a creative man: he is the architect of the famous 'Rock meets classic' which combines symphonic and rock legends. I feel comfortable and happy to work with them. You see, Excalibur is a colossus. A project outside the norm that requires total commitment. Their enthusiasm was so determinant. But to return to the stage it was necessary to be motivated by new content and strong new pieces. So, I was very excited and enthusiast to return to the studio. The desire to do it makes all the difference. As the days go by, first there was two, then six, then ten until there was finally twenty tracks born... These songs or instrumental pieces form a delightful puzzle. All of these titles have a common core. That of a new quest for the famous Knights of the Roundtable. A surprising renaissance. Most of these songs express either the chaos of our world or the nostalgia for a world inhabited by grace. These knights battling a society emptied of all forms of dreams symbolize the universal quest. I could thus identify several great voices. Excalibur was indeed back! For my greatest happiness. What about the guests invited to this Roundtable? Excalibur offers this extraordinary opportunity to gather true legends of rock, folk, song... The 2016 tour is a real exceptional vintage. Imagine the voice of Mike Oldflied band's international successes (Moonlight shadow, To France...) by the divine Maggie Reilly, imagine the mythical saxophone of Supertramp John Helliwell along with Jesse Siebenberg, one of the band's famous singers, imagine Martin Barre co-founder and guitar hero of the legendary Jethro Tull (the famous solo on "Aqualung"), imagine John Kelly, one of the golden voices of the Kelly Family and creator of Elfenthal alongside the bewitching Maite Itoiz, imagine Moya Brennan the sublime voice of the mythical Irish group Clannad (Duet with Bono "In a lifetime"), imagine Michael Sadler, one of the greatest legends of rock, singer of prog-icon SAGA, and then imagine a very original German artist Eric Fish (Subway to Sally)... Then you have a little preview of the show! And then there are two extraordinary voices very important to me and that the German audience will discover: first the singer Roberto Tiranti which literally Bewitched 8000 spectators during the last concert of Excalibur in Britain and Siobhan Owen, a young harpist and singer, of just 20 years of age, who seems to literally fall from the sky because this lady sings like an Angel. She has recently triumphed in "Tristan & Isolde" and just got an awards as the best young Celtic artist by the BBC. These artists form a true musical round table. Happy and surprised to be together to share a big stage whit a Symphony Orchestra, a solid rock folk band, Irish and classic dancers under the guidance of an outstanding MC. Merlin himself portrayed by a great artist: Ralf Bauer. An actor who carries the character with such an energy, a tenderness and an invigorating nobility. A humourous Merlin who is full of surprises! Excalibur belongs to the tradition of the great rock operas. It is a very dynamic show where symphonic music, Celtic and rock instruments blend together to form a story. And what a story! The legend of legends. The legends of Merlin, King Arthur and his knights! The story of the quest for harmony between men and nature. It is a completely new show the public will discover December 2016. The experience I've gained with the two previous tours and the creation of the Symphony ballet "Tristan & Isolde" encouraged me to present a different show. A show where we will occupy the entire stage because I'd really wish to give an interactive show. The choreographies of the Irish dancers are created by Ciaran Devlin, one of the core dancers of the famous "Riverdance"; the show is overseen by Nikolaï Androsov, a great Russian choreographer with whom I've directed "Tristan & Isolde". The lights are created by Roque Segovia a fantastic designer who worked for Peter Gabriel, Roger Hodgson and "Excalibur" from the beginning. Ralf Bauer will surprise the German audience. It won't be a smooth and dark Merlin but a challenging Merlin, which will challenge us on our raison d'être, on the future of our dreams. This Merlin is a smuggler! I have not forgotten the presence of Simone Heitinga (Cirque du Soleil) who embodies a truly realistic Fata Morgana. This young artist is incredible. The acrobatic figures that she performs above the stage are of great sensuality. Simone is mesmerizing. I wish the public comes back out happy, with their head in the clouds! And the music? What are we going to hear? This new Excalibur is an original score, an alchemy where Symphony Orchestra, rock and folk virtuoso offer the best to this iconic legend. During the first 15 years of Excalibur, I composed 63 titles which formed the first trilogy of albums, earning several Gold records and received two awards in the United States. But there is nothing worse than resting on your laurels. With passion and determination, I went back in studio to offer 20 new pieces. Great ballads will stand alongside rock pieces. 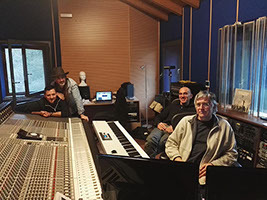 I had the chance to compose in the past for members of the almost mythical groups: Midnight oil, Fleetwood Mac, Yes, The Moody Blues or Roger Hodgson (ex-Supertramp) I am also very fan of the sound of Pink Floyd, Simple Minds, Coldplay, Keane or Rod Stewart. I think that these new pieces show there influences. So yes, it will groove in the arenas. You know, this new Excalibur is a real undertaking and I will honour the public, the artists and the producer who gave me their confidence. A big thank you to all. Now I give you appointment in December 2016!